Hot Price! Coupon code AR7F6M8W knocks 50% off! Pay just $29.99 and FREE shipping! ALUMINUM MATERILA AND BEST EXPERIENCE: Adopt aircraft-grade aluminum T-tube and deck, which supports great bearing force: up to 50kg. 3-wheel design makes it easy to ride and turn under the premise of safety. 3-LEVEL ADJUSTABLE HEIGHT: New and adjustable T-bar accommodates little ones as they grow up: from the deck to handlebars - 64cm ( 25.20in ) up to 84cm ( 33.07in ); in addition, when need to adjust the height of the scooter, the riders should unscrew the safe lock, this design is not only simple but also prevents risk of being hurt. 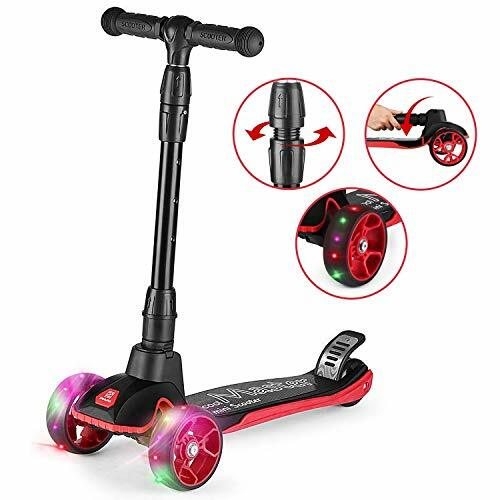 DURABLE WHEELS AND REAR FENDER BRAKE: High-end wheels make riders always feel smooth and in control when kicking along the sidewalk; plus, it's easy for them to apply the rear wheel cover to brake and control the speed. SUPER-COOL LED LIGHTS: Colored LED lights appear when the car slides, which gives riders a super fantastic experience when riding at night. FOLDABLE DESIGN: This scooter can be folded up into a compact footprint, so riders can fit it inside a bag or carry it at their side.